..I ended up with an unappetizing piece of gray meat. I was so disappointed that even though I had cooked the meat to 130F, the meat continued to cook until it was well past done! Contrary to the recipe, I should have taken the meat out at 120F, and maybe I would have had better luck. In short, this recipe was a total bust, and I ended up caramelizing a lot of onion so I could make a palatable sandwich out of gray shoe leather. Unfortunately, the meat was very dry and I never posted that recipe. You can thank me for that! 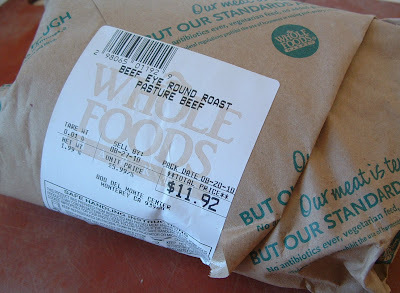 On Cook's Illustrated's recommendation, I bought 2 pounds of grass-fed eye-round. The cost was $5.99 per pound, and I think it's well worth it. Grass-fed beef is leaner, by the way. It also tastes better, has a nice texture to it and it's hormone-free. What's not to love about that? Sprinkle all sides of roast evenly with salt. 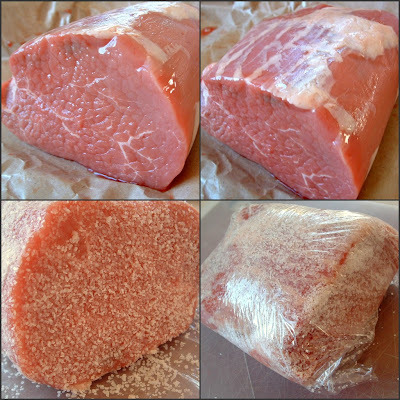 Wrap with plastic wrap and refrigerate 18 to 24 hours. 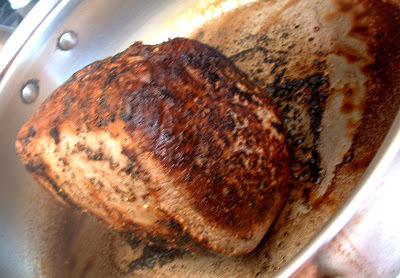 Pat roast dry with paper towels; rub with 2 teaspoons oil and sprinkle all sides evenly with pepper. Heat remaining tablespoon oil in 12-inch skillet over medium-high heat until starting to smoke. Sear roast until browned on all sides, 3 to 4 minutes per side. (Sorry, the shot is a bit out of focus. I was using my older camera, which didn't shoot well in low light.) 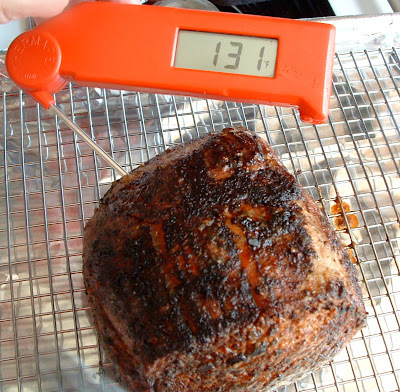 Now, Roast until meat-probe thermometer or instant-read thermometer inserted into center of roast registers 115 degrees for medium-rare, 1 1/4 to 1 3/4 hours, or 125 degrees for medium, 1 3/4 to 2 1/4 hours. I have to say that my therma pen is one of my many favorite kitchen tools. It's accurate and has saved me from overcooking a lot of meat dishes! Now, that's what we're talking about! The color is beautiful and appetizing. Transfer roast to carving board and let rest 15 minutes. 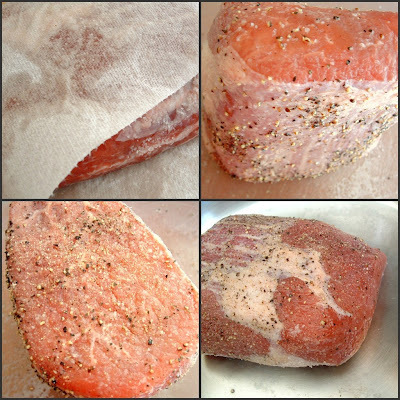 Slice meat crosswise as thinly as possible and serve. The beef was juicy and flavorful. Next time, I'm adding garlic powder or my Susie-Q seasoning to give it more of an Italian flair. I'm not thrilled with how the sandwich photo turned out. You'll have to take my word that I am very pleased to be able to make my own roast beef, at home. My hat's off to Cook's Illustrated. This one is a winner. In a way, this beef reminds me of the Santa Maria Tri-Tip recipe (without the unique smokey flavor) that I got from Cook's Illustrated. 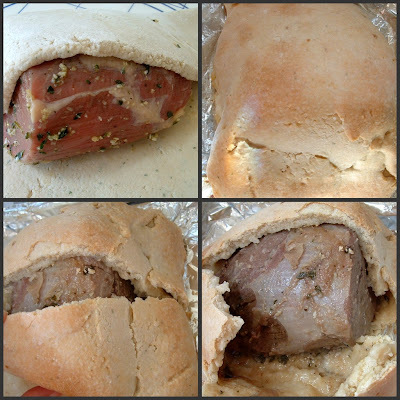 It's too cold to grill, so an oven method like this is a great winter substitute. A printable recipe is at the bottom of this post. 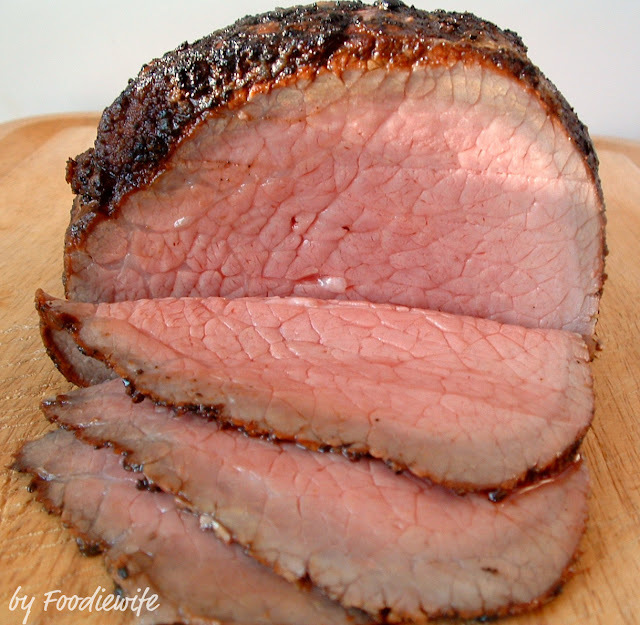 Slow Roasted Beef (Cook's Illustrated)<p>Using a fairly inexpensive cut of beef (eye-round) and roasting it low and slow yielded a flavorful and very juicy roast. 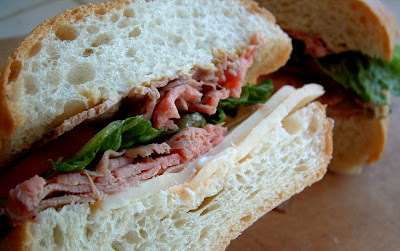 This would be perfect for a Sunday dinner, but I roasted this to make roast beef sandwiches. 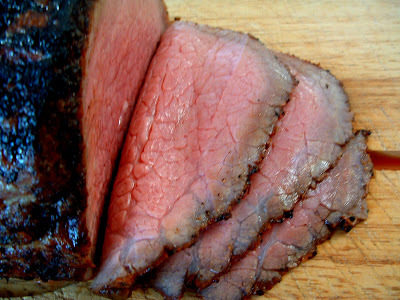 Plan to make this one day before ... See Slow Roasted Beef (Cook's Illustrated) on Key Ingredient. JUMP to my blog site to view and print these recipes, please!